Over the weekend we finally received our first real snow of winter, and I couldn't be more excited! And with that first snow, you can guarantee that soup is going to be on the menu. 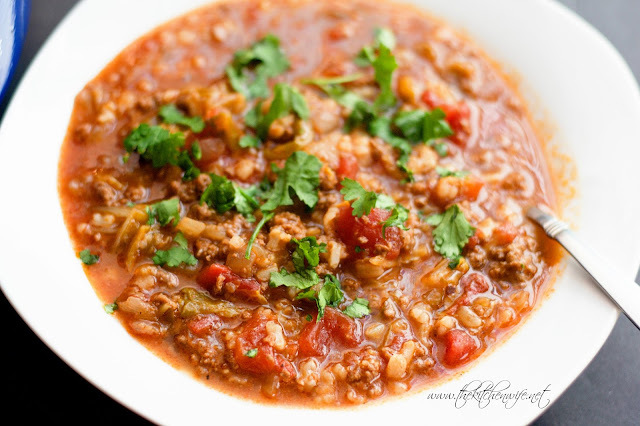 Usually I would go for something like my Perfect Chili Recipe or my Healthy White Chicken Chili Recipe, but since I was on my 10 day detox for The Daniel Plan, I had to change it up a little. 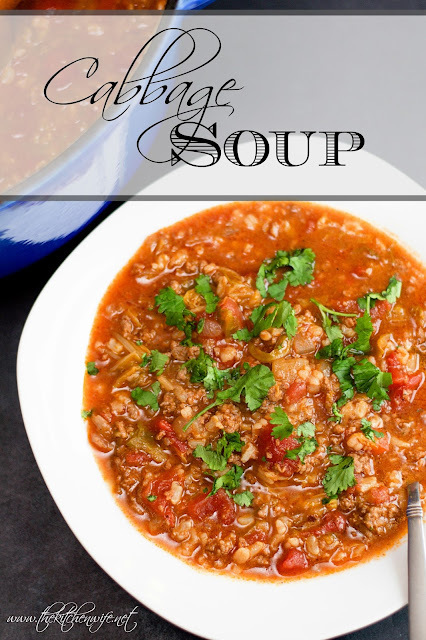 That's when I decided to try something I had never made before, and this delicious Simple Cabbage Soup Recipe was born. To begin go ahead and chop your cabbage into bite-sized pieces. Of course you can use any kind of cabbage you like, but I used Napa Cabbage because Studhubs is not a big fan of cabbage, and this has a milder taste. Next place a heavy bottomed pot, such as one of these cast iron dutch ovens, over medium/high heat. Add a little extra virgin olive oil, and allow the pot to get hot. Once the pot is hot (hehe I made a rhyme) you will add your onion. Allow the onion to cook for 2-3 minutes until it is soft and translucent. After that you will add the minced garlic to the pan. Let it cook just long enough that you can smell it coming up from the pan. As soon as you smell the garlic coming up from the pan, add the ground meat. I used ground beef here because that is what I had on hand, but ground turkey or chicken would be delightful in this as well. Also, if you wanted to keep this vegetarian, you could use lentils instead. Allow the ground meat to brown and cook completely. When your ground meat is fully cooked you will add the diced tomatoes, juice and all. Then you will add the can of tomatoes paste. Stir together until the tomato paste is incorporated into the ground meat. Once the soup has come to a simmer you will add the cabbage. Stir it into the soup and allow it to simmer for 20 minutes. After 20 minutes you will add the brown rice. Allow the soup to cook for another 10-15 minutes. Taste for seasoning and you are ready to serve! I was truly shocked at how much flavor this Simple Cabbage Soup had. The ingredients are so humble, but honestly I've found that the best food comes from simple ingredients. So as you are embarking on those cold winter nights, give this amazing Simple Cabbage Soup Recipe a try! It's so delicious and I know you are going to love it! PS- Its even better the next day for leftovers. Chop the cabbage into bite-sized pieces. Place a heavy-bottomed pot over medium/high heat. Add a little extra virgin olive oil and allow the pan to get hot. Once the pan is hot, add the onion and allow to cook for 2-3 minutes, until soft and translucent. Add the garlic. Allow to cook until you smell it coming from the pan. Add the ground meat to the pot and season with salt and pepper. Allow to fully cook. Add the diced tomatoes & tomato paste. Stir into the fully cooked ground meat. Add the Worcestershire sauce, chicken stock, and water. Bring to a simmer and add the cabbage. *Using brown rice may cause a longer cook time.